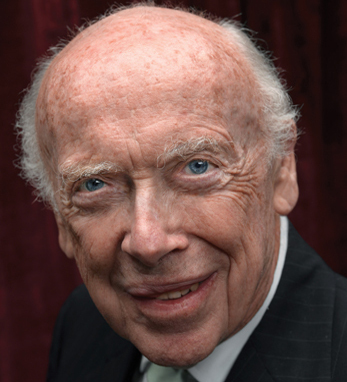 Dr. James Watson is a Nobel prize-winning scientist, chancellor emeritus of Cold Spring Harbor Laboratory, and 2011 inductee to the Irish America Hall of Fame. He was one of the key co-discoverer’s who unraveled the structure of the DNA while a student at Cambridge University, one of the biggest scientific breakthroughs of the 20th century. It resulted in a Nobel Prize in Physiology in 1962. Later, he accepted a position in the biology department at Harvard University. It was here where he wrote his classic Molecular Biology of the Gene and the award-winning Double Helix. After Harvard, James led the Cold Harbor Laboratory, where he devoted his energies to setting up the Human Genome Project. “Deeply proud” of his Irish ancestry, James is a third-generation Irish American with roots in Tipperary. His great-grandparents had emigrated to Ireland in the 1840s, settling in Ohio and later moving to Indiana. He has received numerous awards throughout the years including the National Medal of Science, the city of Philadelphia Liberty Medal, and the Benjamin Franklin Medal Award by the American Philosophical Society. In 1962, he was elected to the National Academy of Sciences and, in 1977, he received from President Ford the Medal of Freedom. In addition to numerous honorary degrees, in 2002, Queen Elizabeth II made him an honorary Knight of the British Empire.